Marvel Legends Rhino Wave Kraven the Hunter Loose. Condition is Used. Shipped with USPS First Class Package. Marvel Legends Spider-Man Rhino BAF Head Torso Arm Leg. Condition is Used. Shipped with USPS Mail w/ tracking number. Marvel Legends baf Rhino RIGHT ARM ONLY. Arm is in excellent condition. Marvel Legends Chameleon Figure Rhino BAF Wave. Condition is New. if you pay on Friday, I’ll ship Saturday. US Shipping only Shipped with USPS Priority Mail. Condition is Used. Soon to be replaced. Listing is for all 3 figures. Figures were displayed only by collector. All shown accessories included. Please pay within 2 days of purchase or contact me for other arrangementa. I will ship securely within 2 days myself. Feel free to ask questions or request more pictures. Pay pal only plesse. I combine shipping for multiple purchases. Like new, but missing chain. No BAF piece. Ghost Rider. Marvel Legends. Marvel Legends. CHEAPEST WAY, TO SAVE YOU MONEY! Marvel Legends Ghost Rider Action Figure Rhino Series NIB Spider-Man. Condition is New. No returns. Ship united states only. Marvel Legends RHINO. VIEW PICTURES CAREFULLY so you can decide on condition. Condition is New. I'm happy to take any addition photos upon request! Marvel legends 2006 Fearsome foes Rhino Fully articulating Joints are tight Super clean smoke free Pics say the rest Buyer pays any return expenses Follow me for more great action figures and toys Items are sent priority for insurance and speed so the shipping reflects that. Marvel Legends KRAVEN THE HUNTER figure Rhino BAF series Hasbro 6" Spider-man NR. Condition is good. Shipped with USPS Priority Mail. ML Rhino wave Scarlet Spider. Includes everything shown, NO BAF PIECE. Light wear but tight joints and no major scuffs. Condition is Used. Has been in storage since. 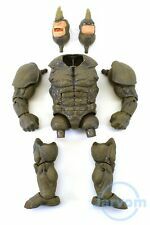 Marvel Legends Rhino Left Leg BAF piece from Ghost Rider. Condition is Used. Shipped with USPS First Class Package. Smoke and pet free home. Collector owned. MISTY KNIGHT. NEW SEALED NICE SHAPE. Up for sale is a Marvel Legends Scarlet Spider-Man from the Rhino Series by Hasbro. The packaging has normal shelf wear. If you have any questions please feel free to message me. I only ship to the upper 48 states. Thanks for looking. Marvel Legends Ghost Rider from the Rhino wave. Bike from the ghost rider box set. Grade 9.5 near perfect condition very rare contains street style display base and accessories These were purchased by me personally stored and put away. I don’t do this for a living this was my personal collection so my goal is get it to you like it left me. **Sorry no international shipping, **no bidders with 0 feedback. Auction cancelled. **2 days to pay or item relisted, if no answers on bidders who don’t pay will be turned to eBay. **Please check all info that you agree to these Terms to bid. Thank you for looking have a nice day! Marvel Legends 6" Inch Rhino BAF Wave Superior Venom Loose Complete. Condition is Used, in excellent condition. Shipped with USPS Mail w/ tracking number. This is for the empty box only for the Ghost Rider from the Marvel Legends Spider-Man Rhino Wave. Box is complete with the inner cardboard tray and plastic mold. Box has a hairline crease in the peg hook at the top of the package which can be seen in the main photo. Free shipping. US bidders and PayPal only. Marvel Legends Infinite Series Superior Venom Spider-Man Rhino No BAF. Condition is box has been opened but figure can easily go back inside. Box is in pretty good shape overall (see pics). Shipped with USPS Priority Mail within 2-3 days of purchase. Feel free to message me with questions or inquire about other figures.